Is it me, or does anyone else never have enough stitch markers? I know that there are dozens down the back of my sofa, because I keep finding them. There are probably several on the floor of the car, under the seat. I'm guessing there are also lots embedded in projects that are on a time out. Whatever the reason, I know that I have a shortage of good stitch markers. I decided to buy some a while ago, but they were split ring based, and the split of the split ring kept catching in my yarn. So goodbye split ring stitch markers, you look pretty, but I cannot use you. 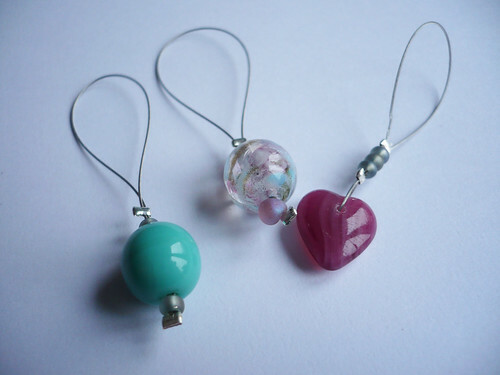 So in a fit of enthusiasm, I dug out my jewellery making supplies and whipped up these little beauties. I used up all the odds and ends of beads that I have left over from various projects. I like that they are all different. I used tiger tail which, for those who have never used beads for anything other than knitting, is metal wire that is coated in plastic. It is flexible, strong and doesn't tarnish. 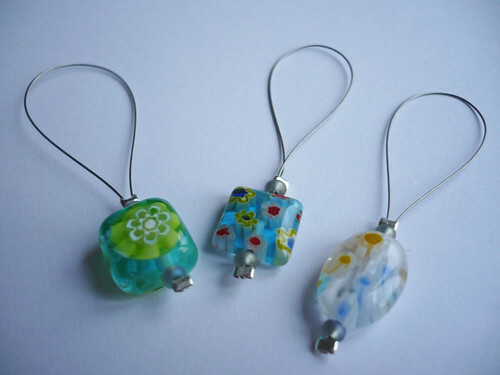 It really is very useful for things like stitch markers. 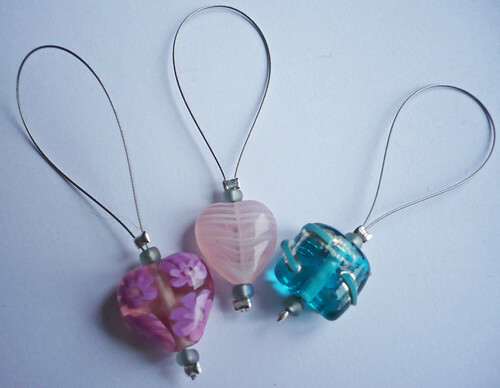 They are very simply made, these little stitch markers. Each one only took; some tiger tail, a pretty bead, two small seed beads and two crimps. I essentially followed exactly the same process as KnottyGal did in her tutorial, which is similar to the technique I have developed for making stitch markers, except I added the seed beads between the crimps and the big bead. 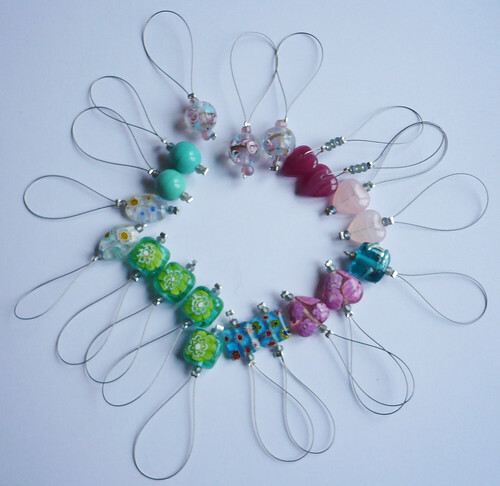 I've just realised that I never shared my previous stitch markers with you, or at least I can't find the blog post if I did! I made them in March, and I think they got swallowed up with KniCroBlo 2011 and the preoccupation of the approaching surgery. (That feels so long ago now!). As you can see, the design is a little different with these older ones. 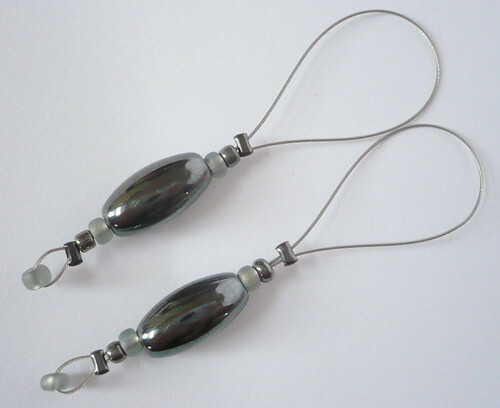 These older ones keep the ends of the wire inside the beads, which means there is less chance of the wire ends catching in the yarn, but it is more fiddly to make the markers this way. So I tried KnottyGal's technique this time. I have to say, they were a lot quicker to make this way, and they don't seem to have caught on the yarn at all yet. I think you just have to make sure you trim the wire ends right back to the crimp. It's so nice when you can make something pretty, that is also incredibly useful! Thanks to KnottyGal for putting up her tutorial and prompting to get off my backside and make some more stitch makers, rather than swearing when I run out!